An essential tool for homes with wide openings, the Carlson Maxi Extra Tall Walk-Thru Pet Gate is a convenient, chew-proof way to contain and protect both your pet and home. 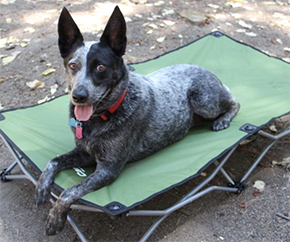 The 38” height is ideal for large dogs or the pup that likes to jump. Made of an all-steel construction, the Maxi Extra Tall Walk-Thru gate is designed to expand and can be configured to fit a range of openings. Use the wall-mount system for easy installation and a secure fit. The walk through design also features a 10” x 7” pet door letting small animals pass through while everyone else stays put. As mix of functionality and convenience, the Carlson Maxi Extra Tall Walk-Thru Pet Gate is sturdy and easy to operate. At an impressive 38” tall, it was made for larger dogs, or ones that like to jump. To handle the everyday use, it features a 100% steel frame. For ease of set up, the maxi gate installs in minutes. The simple wall mount system includes hardware to mount brackets to the wall. Just affix the hardware to the wall and slide the gate securely into the openings. The Maxi Extra Tall Gate is designed to expand and can be configured to fit openings between 51” and 59”. Using additional extensions this gate expands to an astonishing 12 feet wide. Extensions come in 24” panels and can be added to accommodate wider spaces. The 24” extensions are sold separately. The gates convenient design allows adults to walk through by simply sliding to release the safety lock and lifting up on the handle. The 16” door opening provides space for you to walk through, an invaluable benefit compared to stepping over the gate every time. 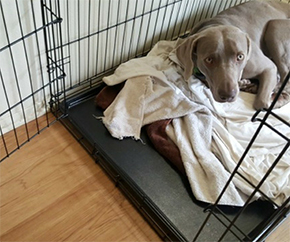 Your smaller pet is afforded the same convenience as the gate features a 10” x 7” pet door allowing your small animal to pass through easily. The Carlson Maxi Extra Tall Walk-Thru Pet Gate is lightweight, portable and compact. When you need to take your gate down, just lift it out of the mounting brackets for easy storage. The Carlson Maxi Extra Tall Walk-Thru Pet Gate is backed by a manufacturer’s limited 90-day warranty. Carlson’s gates are designed specifically for your pet. Instead of repurposing baby gates, Carlson has created a solution that suits all breeds and lifestyles. When getting a dog, we know they will need daily exercise. Depending on their size, breed, and health restrictions, their daily exercise needs may vary. We break down how much exercise is helpful. What's Better: Crate Training or Using a Pet Gate? The energy of a puppy seems to have no limits. If you’ve ever trained a pup, you understand the necessity of a watchful eye at all times of the day. Here are ways to determine whether a pet crate or a dog gate would be more effective. Puppy chewing is so common, but you don’t have to resign yourself to years of gnawed-on furniture and lost footwear. 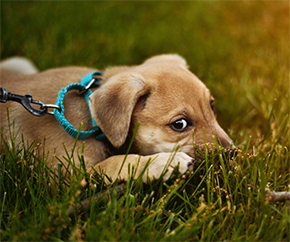 Here are a few tips to help train your puppy not to chew.